Italy is politically divided into 20 regions—a bit like U.S. or Australian states, Canadian provinces, or British regions. Some Italian regions have instantly familiar names—Tuscany, Sicily, Umbria, Apulia—others are not so well-known outside of Italy—say, Molise or Friuli Venezia-Giulia. A few regions are far less famous than the places they contain—for every 100 people who have heard of Rome, maybe 10 will know it is in the region of Lazio. To that end, here is a map of the regions followed by a list of the major tourist destinations (and major cities) within each. Most resources list things like this in alphabetical order, which I find hilarious, since you never visit things in alphabetical order. I will instead roughly divide the regions into Northern, Central, and Southern Italy. This list is by no means meant to be exhaustive of every place within a given region, just indicative. It also focuses on places tourists like to visit, so some regions might highlight tiny towns but leave out major cities (only the boring ones). Click on any region to learn more about it and its attractions. To the visitor, most of these regions make sense: Tuscany is Tuscany (the bit in the middle containing Florence, the Leaning Tower of Pisa, and Chianti wine), Apulia is the "heel" of Italy's boot-like profile, and Sicily is that big island in the south that looks like a misshaped soccer ball the "boot" is kicking. Other regions, however, can stymie the visitor a bit. Not because of what they're called (honestly, what do you care? ), but because Italy's bureaucracy means that each region is in charge of its own tourism promotion—and, Italy being Italy, most regions have a profound and ages-old rivalry with their neighbors. In a practical sense, that means you could literally be standing 10 meters from a major sight in a neighboring region but there will not be a single sign indicating it, nor will the local tourist office have any information on it. For regional borders in the middle of the countryside, this is not too big a deal. Though, for example, it is frustrating to try to get information on all of the Chianti region, since the northern half of the Chianti is administered by the Provincia di Firenze in Florence while the southern half is part of the Provincia di Siena. Even worse are the lakes. The famous lakes of Northern Italy have long defined the borders between regions. So Lake Maggiore's eastern shore is in the region of Lombardy, while its western shore is in Piemonte. Lake Garda is split between Lombardy to the west and the Veneto the east—but the northern tip is actually in the Trentino Alto-Adige! To us tourists, it's one big lake we want to visit; to the local tourism authorities, it is three entirely separate entities. It can get quite confusing, and it has only been in recent years (and slowly) that places like the lakes have formed cross-border tourism promotion websites and the like. The provinces of Italy: Big changes ahead? Italy's regions are further subdivided into administrative provincie, or provinces—a bit like U.S. counties, but with a deeper history and usually pegged to/named for the major city each contains. For example, the Province of Siena is in the Region of Tuscany. Italy currently has 110 provincie—or maybe 100, depending on whom you ask. Soon there may be just 50 or so. As a bureaucratic cost-cutting measure in reaction to Italy's economic crumbling after 2008, a movement arose to combine Italy's provinces and reduce the total number to just 51 new Italian provinces. This was supposed to happen by 2014. Then Italian politics got in the way. Offically, both Sicily and Sardegna have done away with their provincial boundaries—which is how the total drops to 100 from 110—yet somehow those individual provincial offices within Sicily and Sardegna are all still operating because... Italian politics. So: Italian politics. Maybe, one day, you will arrive and find that things have changed and there are half as many provinces as you thoguht. Maybe not. At any rate, they are still hashing out all the details—like what to call the new provinces, since Siena and Grosseto would suddenly share hegemony over all of Southern Tuscany. 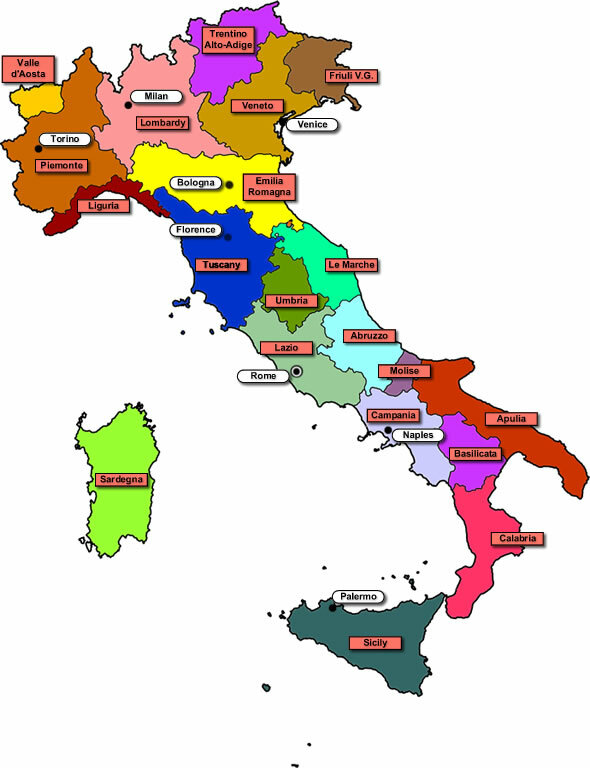 The shotgun wedding of provinces I will be most keen to follow will be the linkage of the (formerly separate) provinces of Pisa, Lucca, Livorno, and Massa Carrara to form a new province covering most of Tuscany's northern coast. Not so much Massa, but the others? They hate each other, and have had for hundreds of years. Livorno was actually purpose-built by the Medici to compete against Pisa in the Renaissance shipping wars, and Pisa has never quite forgiven that—heck, it barely accepts the upstart's existence just 25km (15 miles) down the road. So this will be an interesting experiment in national unity over campanilismo ("belltowerism," the fierce loyalty each Italian feels for his or her hometown, defined as the distance within which you can hear the bells ringing in the main town church). And maybe—just maybe—fewer tourists will get lost trying to navigate the 11 miles from Pisa to Lucca.